Situated near the picturesque lake of karst origin, the Accesa Etruscan settlement covers a vast area thickly forested by holm-oak, flowering ash and oak trees. The archaeological researches, beginning in the 1930s, were methodically conducted first by University of Florence since 1980, then by CAMNES-Lorenzo de’ Medici since 2008. The Excavation Projects have brought to light the remains of an area inhabited in the 6th century B.C. 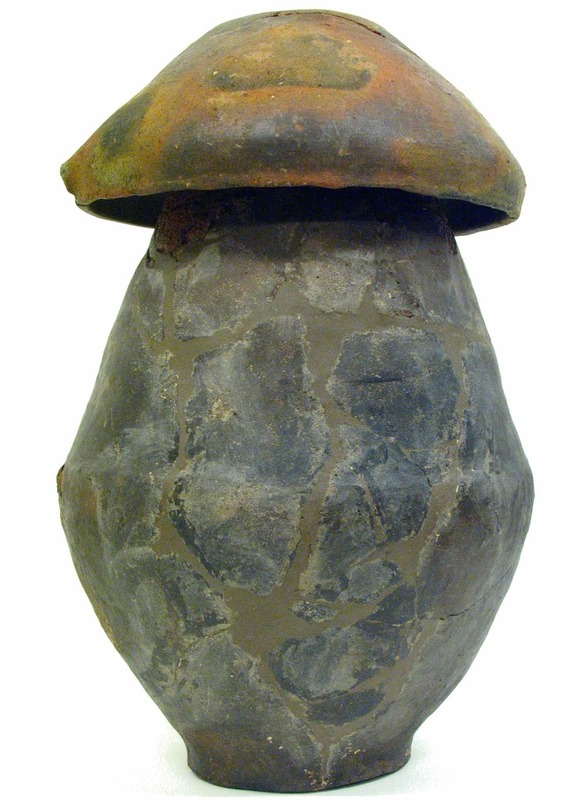 (Archaic period) by the Etruscans, in connection with the exploitation of the nearby mineral deposits, and organised in five quarters, each with its own necropolis. Also necropolis belonging to earlier periods (Villanovan and Orientalizing) were discovered all around the lake. The Accesa Archaeological Park was opened to the public in June 2001, and it was realized under the scientific direction of Professor Giovannangelo Camporeale of University of Florence. A visit to the Park begins with quarter A and proceeds to quarter B, C and D (quarter E is currently being excavated), and merits being completed by a trip to the Archaeological Museum of Massa Marittima, where items discovered in the excavated areas are exhibited. Tomba 16 - Necropoli Macchia del Monte, Accesa (GR). A sinistra una pisside di bucchero scoperta al suo interno. The archaeological site of Accesa enters the interest of archaeologists during the 20's of the last century. 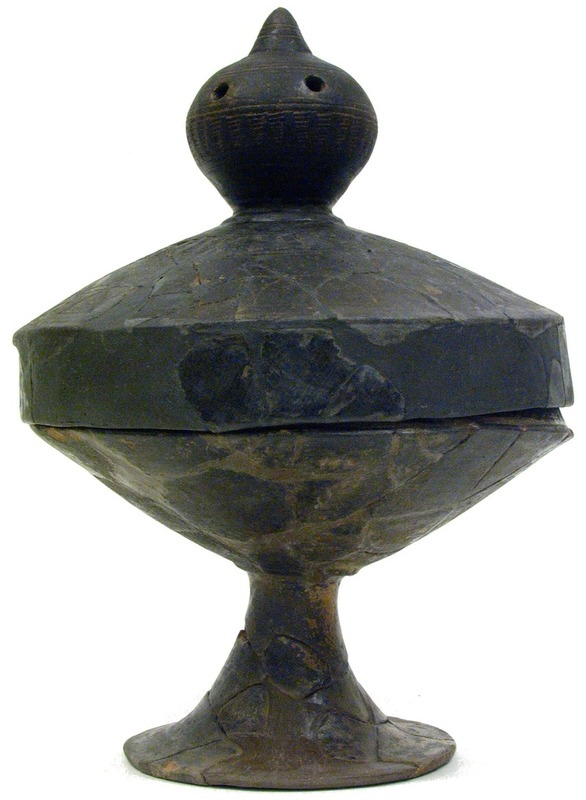 In 1926, at the First National Etruscan Conference, was organized an excursion at the site. The visitors were able to notice a large amount of slag of the ancient processing of smelting and iron ore, which was mined in the nearby mines of Serrabottini and Fenice Capanne. From 1928 to 1930 were carried out archaeological excavations under the direction of Doro Levi in ​​collaboration with Gaetano Badii, published in the Ancient Monuments of the Lincei XXXV, 1933. 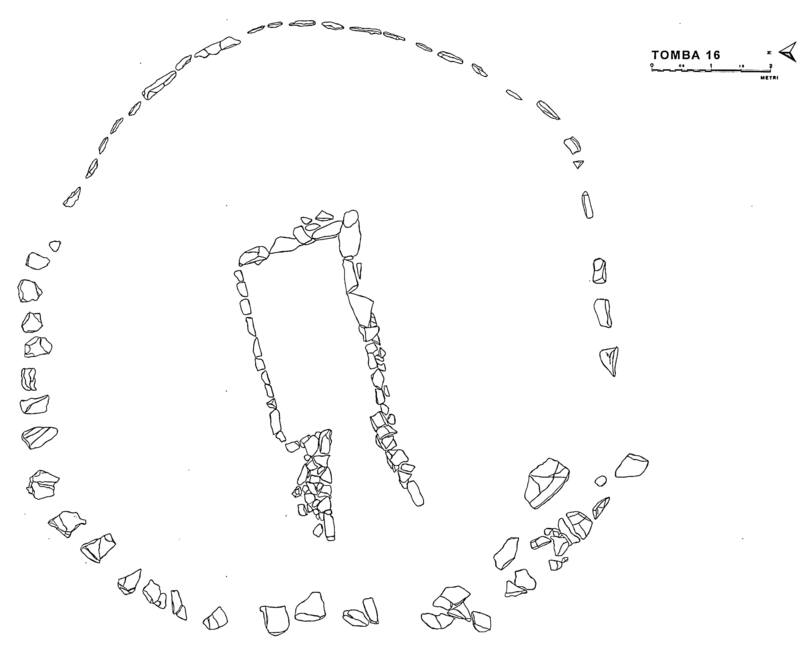 The attention was focused on the graves, a typical approach of tha time. The few remains of buildings that were found were not discussed in depth nor on the ground or neither in literature. The tombs, of various types, almost all violated, often had been disrupted in their structure by the actions of violators. The findings, though poor and deteriorated, have allowed us to outline a profile of the local culture between the ninth and sixth centuries BC. The inhabitants had to be engaged in the mining, metallurgical and smelting activities. The settlement depended on the large center of Vetulonia, to which it was linked by the natural route marked by the river Bruna, which is an emissary of the lake and that flows towards Vetulonia. The excavations were resumed in 1980, with regular annual campaigns conducted by the Department of Classics "G. Pasquali" of the University of Florence until 2010. The main interest was steered towards the settlement, in which were brought to light several Districts. The tombs were not neglected (those explored are over forty), which have expanded and pointed out funerary ideology issues, which had emerged already during the 20's of the last century. Since 2011, the excavation permit of the Ministery of Antiquities and the study of the collected data has passed to the Lorenzo de 'Medici Institute and the following year to CAMNES. Excavations are currently paused. A fianco, Tomba 3 - Necropoli di Macchia del Monte, Accesa (GR). District A - Located at the base of the northwestern slope of Macchia del Monte, it is the closest to the Bruna River. The layout of the neighborhood does not seem to follow a pre-established urban plan, but the alignment of some structures and the existence of a central open space, suggest that there may have been basic planning principles. The buildings were built on several occasions since the sixth century BC, while the area was used until the first century A.D. Only ten abitations are preserved in their foundations; they are constituted by 3 to 7 rooms, this suggests that, the larger ones, could have belonged to families of an upper-middle class. District B - Are preserved only the foundations of the nine housing complexes dating from the late sixth century BC that make up District B, located on the hillside of the Macchia del Monte. Traces of the oldest graves are located within the housing, suggesting that the district has been built on an existing settlement and its necropolis. The provision of housing in the district seems to reflect the social differences related to the community. Infact, only a single house is present consisting of seven compartments, isolated with respect to the other, which at most have three compartments. It is assumed that the property was the largest residence of the head of the community, while the other belonged to the employees. The neighborhood had a necropolis of relevance, located outside of the inhabited area (Graves 3, 4, 5 and 6), dating to the sixth century BC. By following the trail of the path you can find inside the dense forest three chamber tombs and a pit. 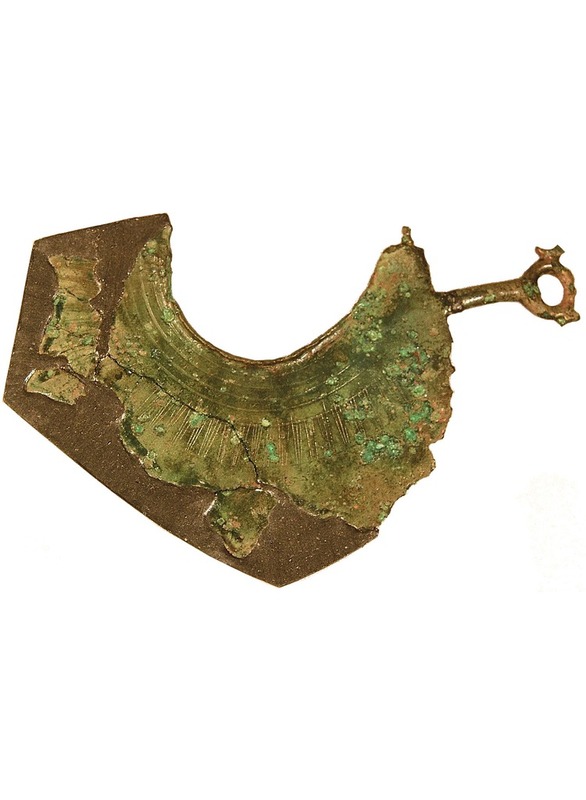 Alongside, a crescent razor in bronze with incisions, Tomb 32 - Macchia del Monte Necropolis, Accesa (GR). District C - The closest District to the Accesa Lake, rises on the western slopes of Macchia del Monte. As for District B, this district was also built on an area previously used as a necropolis (eighth and seventh century BC), as evidenced by the graves and mounds highlighted also on the archaeological path. 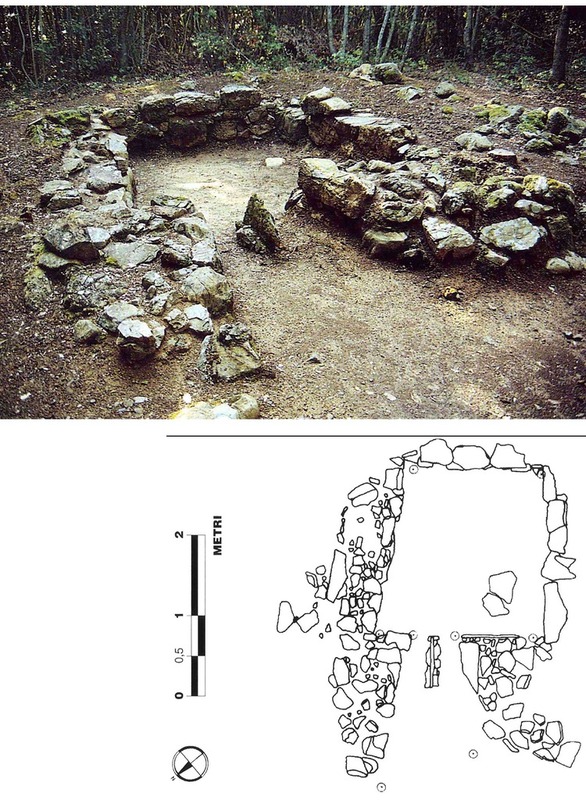 Between the late seventh and early sixth century BC the area was urbanized; the presence of furnaces for metal working, north and south of the District, in proximity to the lake water necessary for metallurgical processes, suggest that the target of the site was purely artisanal. The District consists of small houses, usually characterized by a single room, probably intended for craftsmen, with the exception of a larger and centrally located building, which was perhaps destined to the head or responsible of the District activities. District C had its own necropolis situated at the edge of town. District D - Once this District was definitely a larger area, but the war events of World War II disrupted the area and currently remain visible only the foundations of four buildings. The first settlement dates back to the seventh century BC, in the following century, the area was interested by a new building plan with the construction of terraces, which used the previous structures. 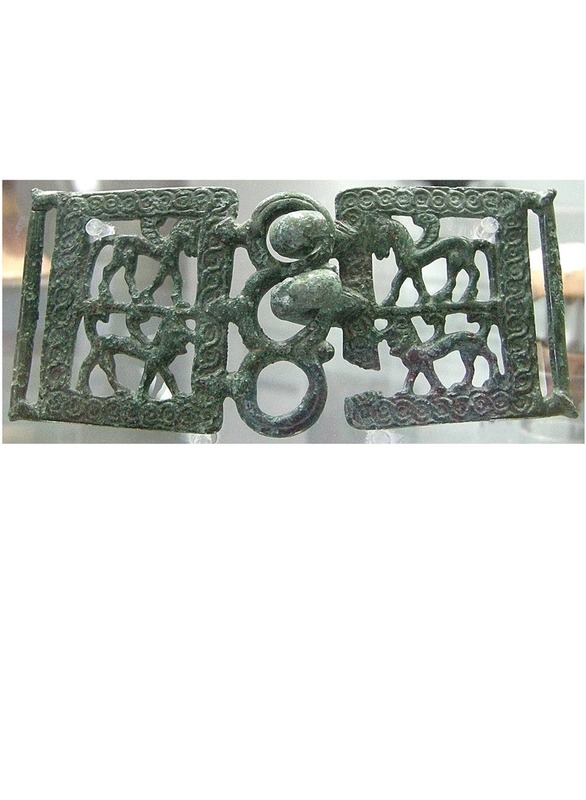 Beside, bronze buckle with knights, Tomb 1 - Macchia del Monte Necropolis, Accesa (GR). LEVI, D., 1933, La necropoli etrusca del Lago dell’Accesa e altre scoperte archeologiche nel territorio di Massa Marittima, in Monumenti Antichi pubblicati per cura dell’Accademia Nazionale dei Lincei XXXV, cc. 5 sgg. alla mostra, a cura di G. Camporeale, S. Giuntoli, A. Parrini, Firenze. VV.AA., 1997, L’abitato etrusco dell’Accesa. Il quartiere B, A cura di G. Camporeale, Roma 1997. CAMPOREALE, G., 2000, I tipi tombali dell’Accesa (Massa Marittima). Dal villanoviano all’arcaismo, in L’architettura funeraria a Populonia tra IX e VI secolo a.C., Atti Convegno Populonia 30-31/10/1997, a cura di A. Zifferero, Firenze, pp. 123 sgg. CAMPOREALE, G. e GIUNTOLI, S., 2000, Il parco archeologico dell’Accesa a Massa Marittima, Follonica. CAMPOREALE, G., 2002, Sui culti dell’abitato etrusco dell’Accesa (Massa Marittima), in Rites et cultes dans le monde antique, Actes Table Ronde, Cahiers de la villa Kerylos n. 12, Paris, pp. 21 sgg. GIUNTOLI, S., 2002, Una nuova necropoli villanoviana all'Accesa (Massa Marittima). Contatti commerciali e culturali in un centro minerario del territorio di Vetulonia, in Atti e Memorie dell’Accademia Toscana di Scienze e Lettere La Colombaria LXVII (n.s. LIII), pp. 9 sgg. GIUNTOLI, S., 2009, Le tombe a circolo dell’Accesa. Riflessioni sui caratteri strutturali di un tipo tombale dell’Orientalizzante vetuloniese in Etruria e Italia Preromana, in Studi in onore di Giovannangelo Camporeale, a cura di L. Agostiniani, A. Bottini, D. Briquel, S. Bruni, G. Colonna, G. De Marinis, L. Donati, S. Haynes, F. Serra, A.M. Sgubini Moretti, J.G. Szilàgyi, Studia Erudita 4, Pisa-Roma. GIUNTOLI, S., 2018, Trent’anni di scavi all’Accesa: un bilancio dell’indagine sull’abitato etrusco e le sue necropoli. Archeologia a Massa Marittima. Giornata in ricordo di Giovannangelo Camporeale Massa Marittima, 24 settembre 2017, ETS, Pisa, 39-56.